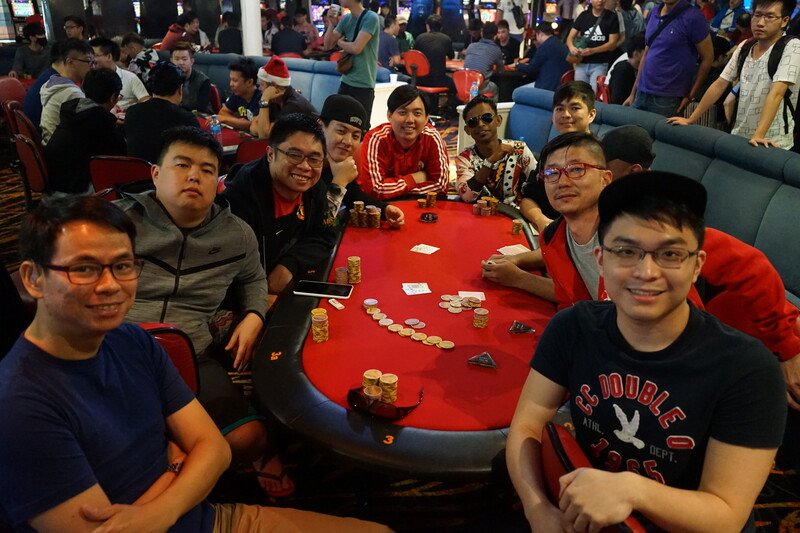 The Singapore Poker Championships returned to the MV Aegean Paradise over the 16-18th of December, for the third and final installment of Season 1. As has become the custom, the year-end edition of the SPC would feature four events across three days, with a High Roller event added to the schedule. To spice things up even further, kaki Bomber Man sponsored a Last Longer Challenge Trophy, which proved a runaway success. After three days of breathless, non-stop poker action, The SPC would close out its maiden season by breaking every record standing. 60 runners threw their hats into the ring for the $1,200 High Roller event, digging their heels in for a steep structure against an all-star cast of experienced and gifted players. After a brutal Day 1, twenty-seven players returned for Day 2, amongst them Bryan Huang, Norbert Koh, and overnight chip leaders Haresh SN and Neo Zhi Han. After an exceptionally bruising two-hour bubble, the final table assembled to the immense relief of the remaining runners. Now assured of at least a minimum cash, players began making concerted efforts to carve out an advantage at the final table with increased aggression. The event lost Andy Li and Norbert Koh in quick succession, before played slowed to a more cautious tempo. Neo Zhi Han and Hoo Teng Yang, who were amongst the overnight chip leads, had built sizeable chip advantages 7-handed, by virtue of some deft and canny manoeuvring at the final table. The two big stacks soon got involved in a defining hand, with the rest of the table happy to get out of the way. Hoo put Neo to the test with an audacious bluff on fifth street, which the latter picked off without undue hesitation. While Neo collected a third of the chips in play after the hand, the affable and gracious Hoo freely admitted that he’d played the hand sub-optimally. Hoo soon regained a bit of parity and confidence when the short-stacked Simon Ng ran AT into his Kings, sending the experienced Simon to the rail in 7th place. He was soon followed by the plucky Fo Kok Hong in 6th, who was unfortunate to find neither the cards nor the spots to gain any sort of momentum at the Final Table. The rough and tumble of the 5-handed play claimed its first casualty in Hoo, who finally found an obstacle he couldn’t hurdle. His A2 was in terrible shape against Haresh’s AJ in an all-in preflop confrontation, and the bricked board would send him to the rails in a very respectable 5th. A 4-handed deal was quickly tabled and agreed to, with players chopping $10,000 each, and playing for $5,900. After half an hour of intense skirmishes, Mick Koh took the bull by the horns by eliminating the mighty Haresh in 4th position. With ownership of 1m of the 1.6m chips in play, it seemed as if Mick already had one hand firmly on the High-Roller trophy. Neo Zhi Han, however, had other ideas. At his umpteenth final table, Neo had some scores to settle with fate, having already seen three trophy opportunities go begging; finishing as runner-up on every occasion. He soon gave himself a fighting chance by eliminating Andy Toh, who had hitherto danced his way deep into tournament with adroitness. A terrific run from Andy, who should be proud of the tournament he played. Heads-up play saw Mick Koh hold a slight chip lead. That lead, however, was soon whittled away by a combination of awful cards and some opportunistic stealing from Neo. Soon, short and sensing the need to pick up some blinds and antes, Mick moved the lot in with pretty much any two cards, and was instantly called by Neo Zhi Han, who tabled a dominant K6. The board bricked out for Mick, and the elated Neo would finally exorcise the demons of tournaments past, while also bagging a hefty payday as a sweetener. With the High-Roller event approaching the business end of the tournament, throngs of players formed an early queue to register for the Main Event. When the dust of entries had settled at the conclusion of registrations in Flight 1B, the Main Event had bested its previous record of 256 by fielding a new personal best of 280 entries, creating with it the largest Main Event prize-pool to date. Adding spice to proceedings was the Last Longer Challenge, available to all comers for only $50. All credit for this event goes to the gentleman known to one and all as Bomber Man. The challenge was his brainchild, the trophy his expense. Headline sponsors Natural8 went one better, by offering a dollar for dollar prize pool match. 103 eventual entries for the Last Longer meant that the endurance supremo would walk away with the princely sum of $10,300. 76 runners managed to connive and bash through the dense ME field to claim a place in Day 2, and put themselves within touching distance of the spoils on offer. As is the ebb and flow of tournaments, play hurtled towards the bubble, and just about ground to a halt on its cusp. Hand-for-hand lasted another gruelling hour, and when the bubble finally burst, one lucky contestant had scooped a minimum cash with just enough chips to post his antes. The serious business of the Main Event commenced at just about 4pm, when the December 9 took their seats for one final push towards the finish line. 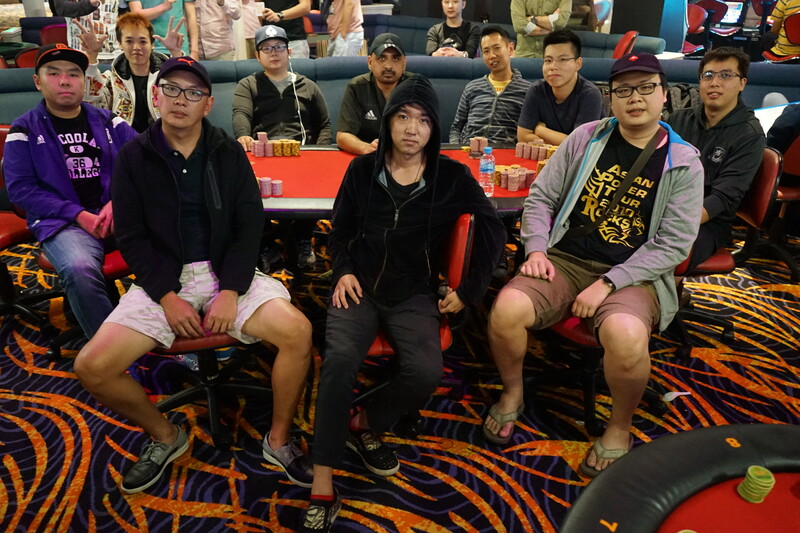 First blood was drawn in typically dramatic fashion, when Yan Yong Cheng moved all his chips into the middle with KQ, and was quickly called by Terence Lai with AJ. Yan looked a sure bet for a critical double through when the KQ8 board gave him top two, and turn laid a duck. An improbable river Ten however, was enough to elicit gasps of horror from the crowd, and send the dejected Yong Cheng packing in 9th. Determined not to be outdone, Le Thai Loc snapped off a shove from Alex Er with TT; the latter tabling A7 for his tournament life. The board delivered three diamonds, A, J and 7. Unfortunately, Alex’s two pair was in for a colossal sweat as Le had the Td up his sleeve. The 4c turn did little to allay anyone’s anxieties, and Alex’s worst fears were confirmed when 5d materialised on the river, enforcing a long trudge towards the rail. Liu Jialin had found the going tough since he sat down at the final table. Card dead throughout, he found himself trapped between Terence on his left, and Le on his right, with Alvin Cheong across him throwing multiple grenades in every direction. Liu finally found occasion to pick up some cheap blinds or find a double through with 33, but Andy Ang was having none of it, comfortably tabling KQ with his superior stack size. Liu dodged all of Andy’s overcards on the T64 board, but wasn’t pleased to see another 4 hit the turn, which doubled Andy’s outs. The karmic flow of rivered winners continued, as another 6 landed on the river, sealing Liu’s fate in 7th. 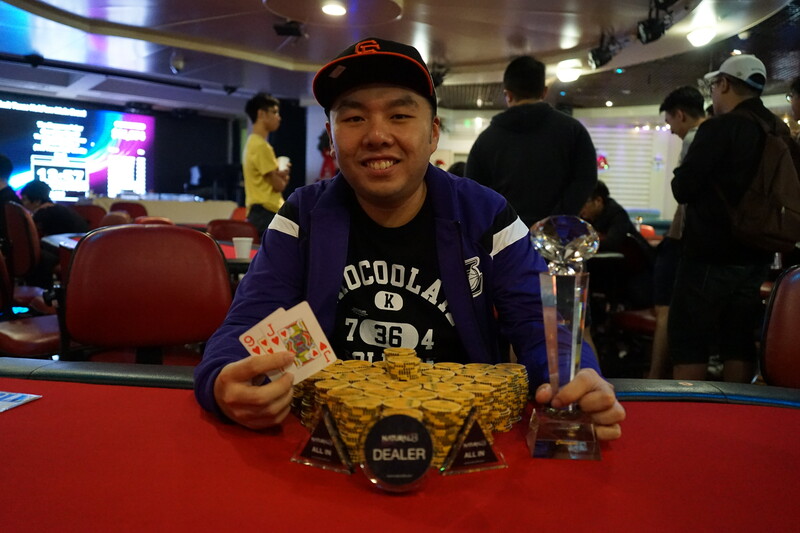 Eric Soh, another previous final tablist and runner-up who had hitherto kept himself afloat with some well-timed steals, was finally caught with his hand in the cookie jar when he found two callers on his all-in shove with 89. To his relief, both Alvin and Terence tabled AT, leaving him in much better shape than he could have hoped for. Relief soon turned to alarm when the flop brought 5QT. The turn 6 gave Eric a double belly buster. The river 4 however, meant Eric would have to be content with a not too shabby 6th placing. The swashbuckling Alvin Cheong, who had kept the railbirds on the edge of their sets throughout the final table with his fearless, high-variance style of play, was next to see his tournament come to screeching halt. Having see-sawed his way from biggest stack to small stack, to medium stack and back to small stack, he found occasion to pick up some of Le Thai Loc’s big blinds from the small blind, only for the latter to snap call with AJ. The bricked board meant that Ace-high prevailed, casting the entertaining Alvin from the final table. The next elimination saw another SB/BB confrontation, where the unassuming and earnest Andy Ang found a pretty standard K-high spot to steal with. Unfortunately for Andy, Terence also found a standard K-high to call with. When the cards were on their backs, it was the former’s K4 up against the latter’s K6. The 7JQ board brought no help to either player, while the turn 5 placed Andy’s back squarely against the wall. The river 2 sealed Andy’s fate, dispatching him in 4th place. The final three of Terence Lai, Le Thai Loc and Cheng Chong Peng, squared off for some of the biggest stakes the Series has seen. Apart from the Main Event prizes, both Le and Cheng were even money favourites for the whopping Last Longer challenge, which was paying out more than 2nd place. After a concerted and sustained 3-handed duel, the Vietnamese eventually bested his Taiwanese competitor; the former’s 55 holding out against Chong Peng’s JT on a KA377 board. With that, Le would guarantee himself a minimum $19,800 payday. A good hourly rate by any standards. 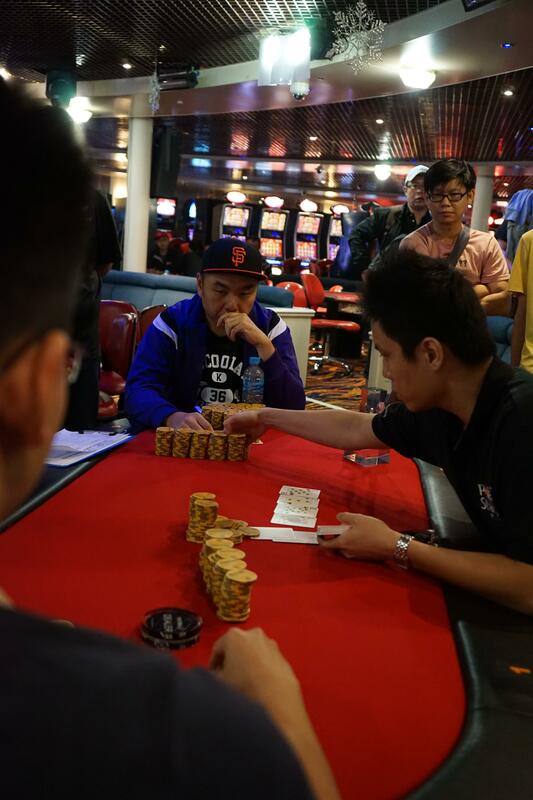 A visibly elated Le then turned his attention to heads-up play, and the steely-eyed focus of Terence Lai. Unfortunately for Le, the heads-up play was very much like Terence: understated, concise and efficient. In merely the 3rd hand of heads-up play, Terence found Le short enough to defend an all-in with J9 and was pleased to discover that Le was only sporting J4. 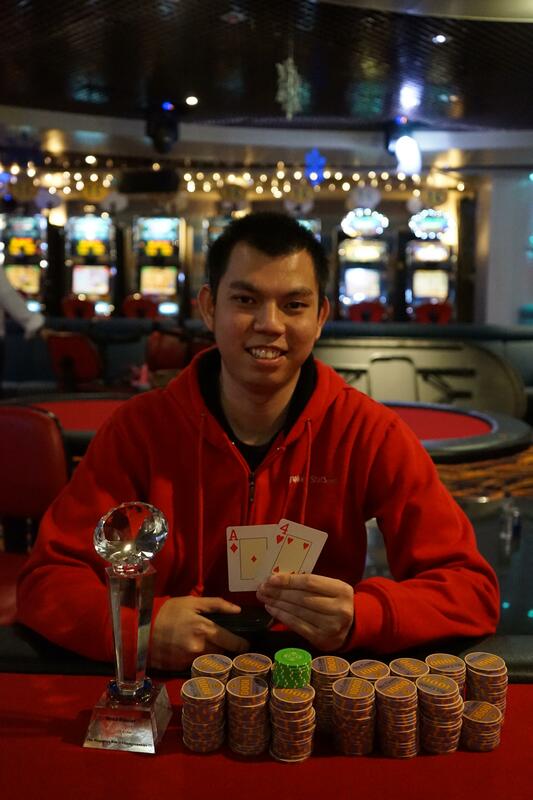 Le was all but slain when Terence struck a 9 on the flop, and the confirmatory K on the turn crowned Terence Lai the SPC III Main Event Champion. *Adjusted pay-outs after 4-handed deal. The Singapore Poker Championships congratulates all winners, and thanks all participants for continuing to take the SPC to greater heights. See you all again soon!